Unless you are totally oblivious, you have probably noticed the recent explosion of neighborhood gardens popping up. Using vacant spaces as gardens is by no means a new idea; in fact, it’s steeped in history. 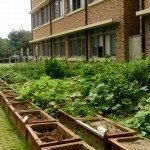 Perhaps, there is a vacant lot in your neighborhood that you have often thought would be perfect for a community garden. The question is how to garden on a vacant lot and what goes into the creation of a neighborhood garden? Community gardens have been around for ages. In earlier vacant lot gardens, home beautification and school gardening were encouraged. Neighborhood societies, garden clubs and women’s clubs encouraged gardening via contests, free seeds, classes and organizing community gardens. The first school garden opened in 1891 at the Putnam School, Boston. In 1914, the U.S. Bureau of Education sought to promote gardens nationally and encourage schools to include gardening in their curriculum by establishing the Division of Home and School Gardening. During the depression, Detroit’s mayor proposed using donated vacant spaces as gardens to aid the unemployed. These gardens were for personal consumption and for sale. The program was so successful that similar vacant lot gardening began to pop up in other cities. There was also a spike in personal subsistence gardens, community gardens and work relief gardens – which paid workers to grow food used by hospitals and charities. The war garden campaign began during World War I to raise food for individuals at home so farm raised food could be sent to Europe where there was a severe food crisis. Planting veggies in vacant lots, parks, company grounds, along railroads or anywhere there was open land became all the rage. During World War II, gardening was again at the forefront. The Victory Garden was not only necessary due to food rationing, but also became a symbol of patriotism. In the 70’s, urban activism and interest in environmental conservation piqued an interest in vacant lot gardening. The USDA sponsored the Urban Gardening Program to promote community gardens. Interest has slowly but steadily increased since that time with the virtual plethora of community gardens seen in urban landscapes. The idea of planting veggies in vacant lots should be fairly straightforward. Unfortunately, it is not. There are many things to consider when using vacant spaces as gardens. Locate a lot. Finding the appropriate lot is the first priority. Land with safe, uncontaminated soil, sun exposure of 6-8 hours and access to water are necessary. Look at community gardens near you and chat with those who are utilizing them. Your local extension office will also have helpful information. Obtain the space. Securing the vacant lot is next. A large group of people may be involved in this. Who to contact may be the result of who the beneficiary of the site will be. Is it for the low income, children, general public, just the neighborhood, or is there a larger organization behind the use such as a church, school or food bank? Will there be a usage fee or membership? Amongst these will be your partners and sponsors. Make it legal. Many landowners require liability insurance. A lease or written agreement on the property should be secured with clear designation regarding liability insurance, responsibility for water and security, resources the owner will be providing (if any), and the primary contact for the land, usage fee and due date. Write up a set of rules and bylaws created by a committee and signed by members that agrees about how the garden is run and how to deal with problems. How you are going to obtain supplies. Who are the workers and what are their tasks? Where will the compost area be? What types of paths will there be and where? Will there be other plants amidst planting veggies in the vacant lot? Keep a budget. Establish how you will raise money or receive donations. Social events promote the success of the space and allow for fundraising, networking, outreach, teaching, etc. Contact the local media to see if they are interested in doing a story on the garden. This can engender much needed interest and financial or volunteer assistance. Again, your local extension office will be valuable too. This is just a taste of all that is needed to create a garden on vacant land; however, the benefits are many and well worth the effort.